Just like their watches, coffee, chocolate and…er…knives, the Swiss know a little something about making high quality products. 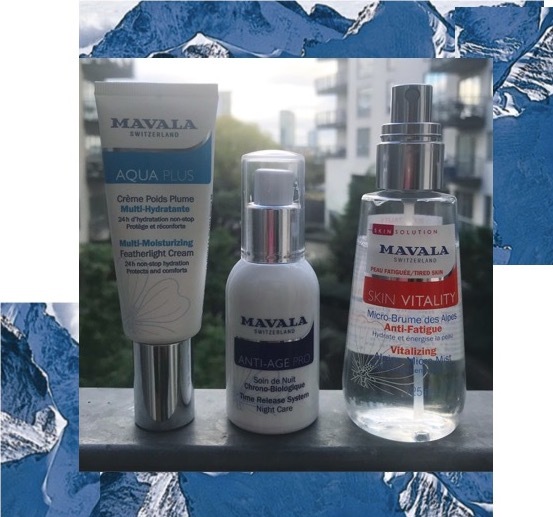 The latest high performing products I have been trying out is skincare is from Mavala, the company that makes those cute little nail polishes. The skincare doesn’t look super fancy, more like something you would pick up at the French pharmacy, the packaging is white, with lots of writing all over it – but lets face it, those are some of the best products you can find and any gorgeous French woman will tell you that. The natural key ingredient of the new Mavalia face care is extracts of the Mallow plant found locally in the Alps. Mallow has smoothing, emollient, astringent and has refreshing properties present in all their products. It is of course, 100% Swiss, and when tested in the labs it managed to flourish in wild areas and in extreme conditions, where few other plants survive, so the clever Swiss scientists decided to add it to their skincare. I have been using this day cream for around three months now and I really like it. Its white, practically scentless and very light. The only product I can compare it to is Kiehl’s Ultra Day Cream. Most skincare products nowadays are infused with scent, have a special texture and come in gorgeous packaging. There’s a lot of competition out there and brands need to stand out, I get it, and it works, but what’s nice about Mavala is, is that it goes back to basics, and focuses more on the actual substance over style, just like the Kiehl’s Cream. Despite its super light texture, the AQUA PLUS Multi-Moisturizing Featherlight Cream provides 24h non-stop hydration for dehydrated skin. It’s highly concentrated in the dermo-soothing Mallow flower and my favourite ingredient, Hyaluronic acids, but this time, three different molecular weights, so its formula penetrates the layers of the epidermis to intensely re-infuse skin with moisture. This cream is subtle yet powerful, really hydrating, feels amazing under makeup and so reliable as an everyday moisturiser. I spray this gorgeous micro-mist all over before my face before I put on my makeup. This smells beautiful and fruity, just like apricot which is so gorgeous and refreshing. It calms my skin down between blow drying and applying my foundation but can be used any time of the day. It’s great for the summer to cool down and also good to sprits onto our face in the winter when you’re indoors and the radiators are on full blast. It helps to protect against pollution and UV rays and generally perks up skin to make it look more radiant. The vitalizing Swiss Apricot extract, high in provitamin A offers toning and antioxidant properties and the organic acids provide gentle exfoliating properties. It makes skin look instantly energised when you’re tired and need a pick-me-up. You can use it any time of the day, its small enough to throw it into your handbag and when sprayed, it doesn’t ruin your makeup, just make sure spritz from far away! This night cream is also has subtle super powers – it’s super light, odourless, so hydrating and doesn’t feel heavy on the skin or greasy. It smooths out wrinkles, clears uneven skin tone and makes skin feel radiant. It’s synchronized on the natural biorhythm of your body, meaning it repairs at night so the ‘Time Release System Night Care’ intensifies the cycle of the nocturnal cell renewal. It contains an extract of Swiss organic concentrated and encapsulated Watercress Seedlings which helps eliminate toxins that lead to a dull complexion, Alpine Rose stem cells, an exceptional adaptogen flower born at a very high altitude, to improve skin barrier function and boost skin rejuvenation, Biomimetic Lipo-amino Acid to help rebuild natural collagen network and an anti-dark spot complex of Arbutin, Vitamin C and Vitamin E evens out skin tone. My final verdict is, if you’re looking for anti-ageing, reliable and quality skincare without the fluff, Mavala will not let you down.